The acclaimed one-man show of the "Poet Laureate of Pine View Heights" Antsy McClain is now available on DVD. This DVD has 65 minutes of Antsy McClain as recorded at the Center for the Arts in Grass Valley, California. 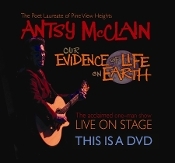 Titled "Our Evidence of Life on Earth" the LIVE DVD includes 15 Antsy originals plus a bonus song that includes the amazing multi-instrumentalist Joe Craven. This DVD was produced by Peter Berkow & Mike Hoopingarner.